Professor Hao Feng prepares to heat metal tubes containing Distillers Dried Grains (DDG) with different reagents to break the glucose (sugar) bonds so they can extract sugars that can be used in Ethanol Production. Using electrolyzed water rather than harsh chemicals could be a more effective and environmentally friendly method in the pretreatment of ethanol waste products to produce an acetone-butanol-ethanol fuel mix, according to research conducted at the University of Illinois. 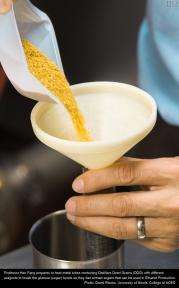 When ethanol is produced, distiller's dried grain with solubles (DDGS) is a waste product. The DDGS is primarily used as animal feed, but researchers are searching for ways to extract the sugar and ferment it to produce an acetone-butanol-ethanol fuel mix. One obstacle has been in the production phase called pretreatment. "For any biofuel production you need to have simple sugars such as glucose," said U of I researcher Hao Feng. The glucose in DDGS is stuck together, forming cellulosic corn fiber, but the structure is very tough. It forms a kind of crystalline structure which is very difficult to break, said Feng. "In order to get the glucose out, we need to somehow destroy the structure. Normally people use a strong acid such as sulfuric acid, or a strong lime base, to loosen it, making holes in it. Once the structure is destroyed, we use enzymes to cut the chain of glucose to get glucose that can be used for fermentation." But destroying the structure with chemicals creates some unwanted effects. "When you break down the structure, sometimes you can produce compounds which are not friendly to the microorganisms used in fermentation. These are what we call inhibitors - they kill the microorganisms like the Baker's yeast used to make ethanol," said Feng. Feng is actually a University of Illinois food scientist. He has been using electrolyzed water in his lab to kill bacteria and other bugs such as E. coli on fresh fruits and vegetables. "We have a machine with two electrodes. Water is neutral, but we use electricity to split the water into two portions with different properties - one is acidic and one is alkaline," said Feng. Realizing that these similar properties in sulfuric acid and lime are used to pretreat DDGS in fuel production, Feng's lab conducted experiments comparing the use of electrolyzed water to the traditional chemicals. "Using the strong sulfuric acid method, there was no fuel produced," said Feng. "The toxic compounds killed the microbes that produce acetone-butanol-ethanol mix completely. Using the alkaline sodium hydroxide as a base, after 60 hours, the acetone-butanol-ethanol production was also relatively low." Feng explained that the delay in production is evidence of toxicity. "The organism has to spend a lot of time trying to adapt to the new environment." "But using acidic electrolyzed water, at about 20 hours the fermentation process began producing the acetone-butanol-ethanol mix. This is an example of less inhibitor production with electrolyzed water compared with the traditional method." Feng said that this new technique also eliminates one production step. "With the traditional acid method they have to remove the toxicity. With electrolyzed water, there is no need for this detoxification, so this process should be more economical as well. The other advantage of this method is that the traditional method produces a large quantity of solid waste that needs to be handled, and some sugars get consumed in the process as well. We want to maximize the sugar yield so we can maximize the ethanol yield." At this point, the process has been successful on the scale of a small laboratory. "Our next step is to look at the economic feasibility of this process," Feng said. "Technically it is doable but economically we'll need to compare it with the traditional method and we'll need additional funding to do that. Then we can move up to the pilot scale." Part of the results from the study is published in a 2009 issue of American Society of Agricultural and Biological Engineers. The work is done in collaboration with Hans Blaschek's lab with participants including Bin Wang, Thaddeus C. Ezeji, Zhen Shi, Xiaojuan Wang, and Yi Wang. The research is supported by the National Research Initiative of the USDA Cooperative State Research, Education and Extension Service and the U.S. Department of Energy.